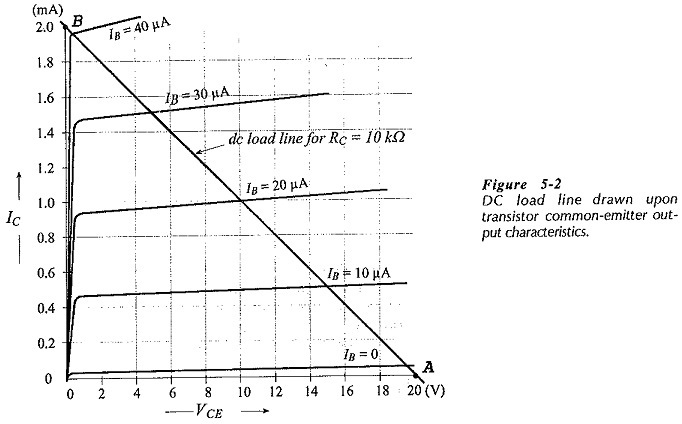 The DC Load Line of BJT Biasing Circuit is a straight line drawn on the transistor output characteristics. For a common-emitter (CE) circuit, the load line is a graph of collector current (IC) versus collector-emitter voltage (VCE), for a given value of collector resistance (RC) and a given supply voltage (VCC). The load line shows all corresponding levels of IC and VCE that can exist in a particular circuit. Plot point A on the common-emitter characteristics in Fig. 5-2 at IC = 0 and VCE = 20 V. This is one point on the DC Load Line of BJT Biasing Circuit. 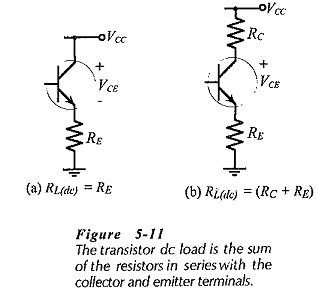 Now assume a collector current of 2 mA, and calculate the corresponding collector-emitter voltage level. Plot point B on Fig. 5-2 at VCE = 0 and IC = 2 mA. 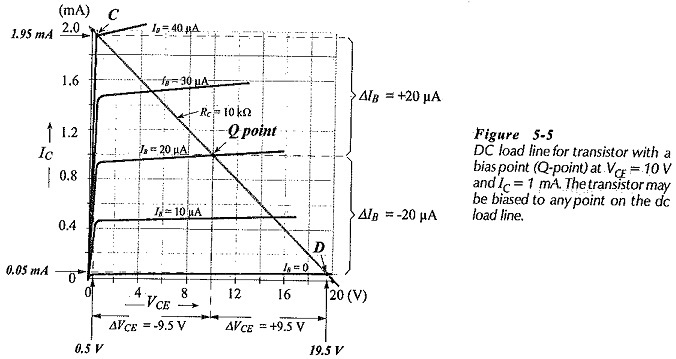 The straight line drawn through point A and point B is the dc load line for RC = 10 kΩ and VCC = 20 V. If either of these two quantifies is changed, a new load line must be drawn. As already stated, the DC Load Line of BJT Biasing Circuit represents all corresponding IC and VCE levels that can exist in the circuit, as represented by Eq. 5-1. For example, a point plotted at VCE = 16 V and IC = 1.5 mA on Fig. 5-2 does not appear on the load line. 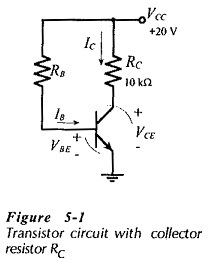 This combination of voltage and current cannot exist in this particular circuit, (Fig. 5-­1). Knowing any one of IB, IC, and VCE, it is easy to determine the other two from a dc load line drawn on the device characteristics. It is not always necessary to have the device characteristics in order to draw the DC Load Line of BJT Biasing Circuit. A simple graph of IC versus VCE can be used. The dc bias point, or quiescent point (Q-point) (also known as the dc operating point), identifies the transistor collector current and collector-emitter voltage when there is no input signal at the base terminal. Thus, it defines the dc conditions in the circuit. 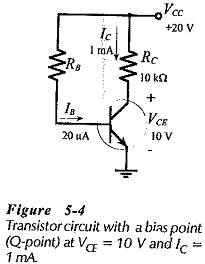 When a signal is applied to the transistor base, IB varies according to the instantaneous amplitude of the signal. This causes IC to vary, and consequently produces a variation in VCE. So, increasing IB by 20 μA (from 20 μA to 40 μA) caused VCE to decrease by 9.5 V, (from 10 V to 0.5 V). Decreasing IB by 20 μA (From 20 μA to zero) caused VCE to increase by 9.5 V (from 10 V to 19.5 V). It is seen that with the Q-point at IC = 1 mA and VCE = 10 V, an IB variation of ±20 μA produces a collector voltage swing of ΔVCE = ±9.5 V.
The base current does not have to be varied by the maximum amounts discussed above; it can be increased and decreased by smaller amounts. For example, a base current change of ±10 μA (from the Q-point on Fig. 5-5) would produce a collector current change of ±0.5 mA, and a collector-emitter voltage change of ±5 V.
Suppose that, instead of being biased half way along the load line, the transistor is biased at IC = 0.5 mA, and VCE = 15 V, as shown in Fig. 5-8(a). 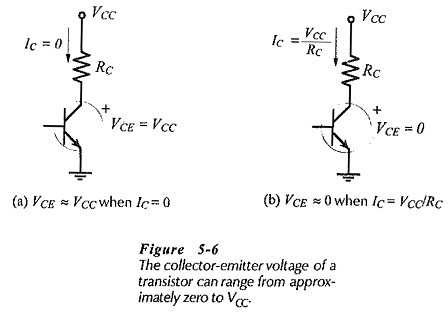 Increasing the collector current to 2 mA reduces VCE to zero, giving ΔVCE = -15 V. Reducing IC to zero increases VCE to VCC, producing ΔVCE = +5 V.
When used as an amplifier, the transistor output (collector-emitter) voltage must swing up and down by equal amounts; that is, the output voltage swing must be symmetrical above and below the bias point. So, the asymmetrical VCE swing of -15 V +5 V illustrated in Fig. 5-8(a) is unsuitable. If IC is driven up and down by ±0.5 mA [see Fig. 5-8(b)], a symmetrical output voltage swing of ±5 V is obtained. 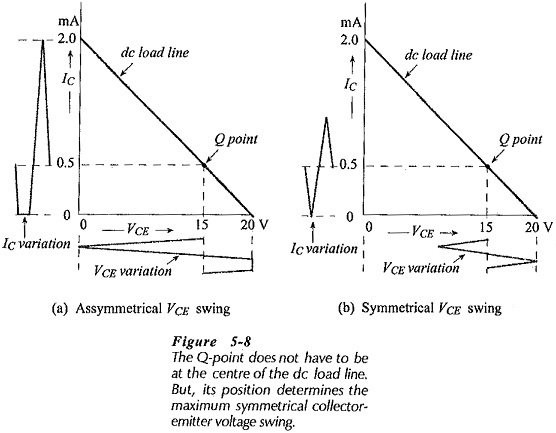 This is the maximum symmetrical output voltage swing that can be achieved with the bias point shown in Fig. 5-8. Transistors in amplifiers do not all have to be biased at the center of the dc load line. The DC Load Line of BJT Biasing Circuit is drawn exactly as discussed, with IE taken as equal to IC for convenience. Note that the voltage drop across the emitter resistor is actually (IE RE), but again for convenience IE is taken as equal to IC.